Grows in low light Blooms yearround Keep evenly moist The plant you will receive is growing in a 4" pot. 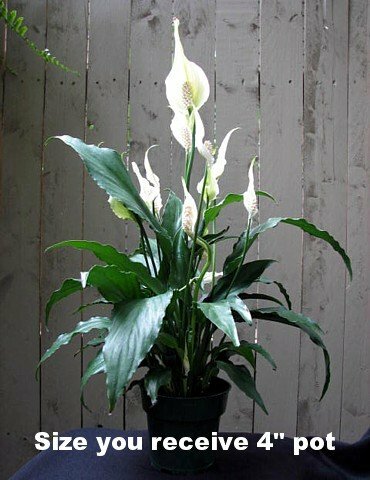 Spathiphyllum the genus name means, literally, "leaf spathe", with spathe defined as "A large bract or pair of bracts sheathing a flower cluster, as a spadix." You're likely to know it as "Peace Lily". Its' widespread interior use is due to its exceptional acclimation to low light conditions. There are approximately 30 different species of Spathiphyllum, some are native to Central and South America. Interestingly, two species are found on the other side of the world, in Malaysia, and one is native to both Costa Rica AND the Philippines. A fascinating plant that has somehow managed to circle the world long before man discovered its beauty. Wherever it is found, it thrives in the deep shade of the humid tropical rainforest understory. The Peace Lily is very different from many plants used today indoors. They let you know quickly when they are dry by a noticeably droop in the foliage. They'll bounce back quickly once watered. The proper time to water them is when the leaves start to droop, just alittle. They are one of the best low light house plants! The plant you will receive is similar to the one pictured to the left growing in a 4" pot.